Parsaei, S., Amini, Z., Houshmand, M. (2014). Effects of Olive Leaf on Blood Metabolites and Humoral Immunity Response of Broiler Chickens. International Journal of Advanced Biological and Biomedical Research, 2(3), 741-751. Siamak Parsaei; Zahra Amini; Mohammad Houshmand. "Effects of Olive Leaf on Blood Metabolites and Humoral Immunity Response of Broiler Chickens". 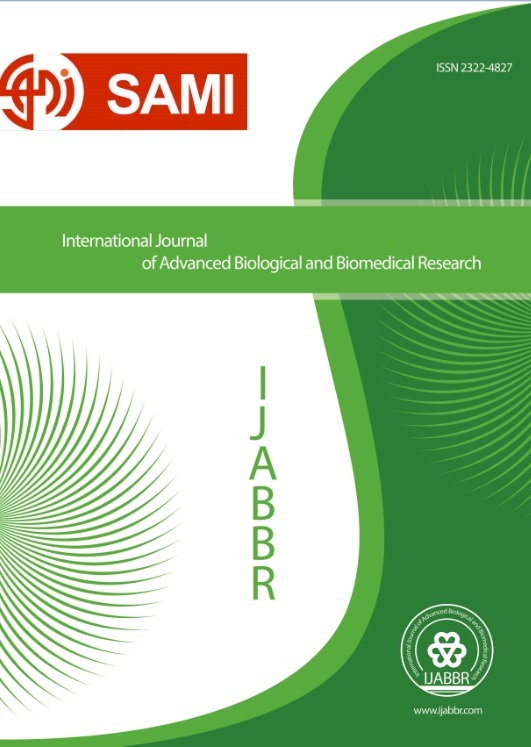 International Journal of Advanced Biological and Biomedical Research, 2, 3, 2014, 741-751. Parsaei, S., Amini, Z., Houshmand, M. (2014). 'Effects of Olive Leaf on Blood Metabolites and Humoral Immunity Response of Broiler Chickens', International Journal of Advanced Biological and Biomedical Research, 2(3), pp. 741-751. Parsaei, S., Amini, Z., Houshmand, M. Effects of Olive Leaf on Blood Metabolites and Humoral Immunity Response of Broiler Chickens. International Journal of Advanced Biological and Biomedical Research, 2014; 2(3): 741-751. Al-Azzawie HF, Alhamdani MS (2006). Hypoglycemic and antioxidant effect of oleuropein in alloxan-diabetic rabbits. Life Science. 78:1371–7. Al-Qarawi A.A, Al-damegh M.A, El-Mougy S.A (2002). Effect of freeze dried extract of Olea europaea on pituitary-thyroid axis in rats. Phytother Research. 16: 286-287. Andreadou I, Iliodromitis EK, Mikros E, Constantinou M, Agalias A, Magiatis P, Skaltsounis AL, Kamber E, Tsantili-Kakoulidou A, et al (2006). The olive constituent oleuropein exhibits anti-ischemic, antioxidative, and hypolipidemic effects in anesthetized rabbits. Journal of Nutrition. 136:2213–9. Andrikopoulos N.K, Kaliora A.C, Assimopoulou A.N, Papageorgiou V.P (2002). Inhibitory activity of minor polyphenolic and nonpolyphenolic constituents of olive oil against in vitro low-density lipoprotein oxidation. Journal of Medicinal Food. 5, 1 –7. Barton M.d (2000). Antibiotic use in animal feed and its impact on human health. Nutrition Research Reviews. 13:279-299. Bauer R, Reminger P (1989). TLC and HPLC analysis of alkamides in Echinacea drugs. Journal of Medicinal Plant. 55: 367-371. Bisignano G, Tomaino A, LoCascio R, Crisafi G, Uccella N, Saija A (1999). On the in vitro antimicrobial activity of oleuropein and hydroxytyrosol. Pharm. Pharmacol. 51, 971–974. Cheema M.A, Qureshi M.A, Havenstein G.A (2003). A comparison of the immune response of a 2001 commercial broiler with a 1957 random bred broiler strain when fed representative 1957 and 2001 broiler diets. Poultry science association. 9, 1591/1529. Chimi H, Cillard J, Cillard P, Rahmani M (1991). Peroxyl and hydroxyl radical scavenging activity of some natural phenolic antioxidants. Journal of the American Oil Chemists’ Society. 68, 307–312. Chiou A, Salta FN, Kalogeropoulos N, Mylona A, Ntalla I, Andrikopoulos NK (2007). Retention and distribution of polyphenols after pan-frying of French fries in oils enriched with olive leaf extract. Food Science. 72:S574-84. Corona G, Tzounis X, Assunta Dessi M, Deiana M, Debnam ES, Visioli F, Spencer JP (2006). The fate of olive oil polyphenols in the gastrointestinal tract: implications of gastric and colonic microflora-dependent biotransformation. Free Radic Research. 40:647–58. Cushnie T.P.T, Lamb A.J (2005). Antimicrobial activity of flavonoids: review. Int. J. Antimicrob Agents. 26: 343-356. Edgecombe S.C, Stretch G.L, Hayball P.J (2000). Oleuropein, an antioxidant polyphenol from olive oil, is poorly absorbed from isolated perfused rat intestine. Journal of Nutrition. 130, 2996–3002. EI SN, Karakaya S (2009). Olive tree (Olea europaea) leaves: potential beneficial effects on human health. Nutrition Review. 67:632–8. Eidi A, Eidi M, Darzi R (2009). Antidiabetic effect of Olea europaea L. in normal and diabetic rats. Phytother Research. 23:347–50. Elliott GA, Buthala DA, DeYoung EN (1969). Preliminary 18. safety studies with calcium elenolate, an antiviral agent. Antimicrob Agents Chemother (Bethesda). 9:173-176. Fki I, Bouaziz M, Sahnoun Z, Sayadi S (2005). Hypocholesterolemic effects of phenolic-rich extracts of Chemlali olive cultivar in rats fed a cholesterolrich diet. Bioorganic & Medicinal Chemistry. 13:5362–70. Gonzalez M, Zarzuelo A, Gamez M. J, Utrilla M. P, Jimenez J, Osuna I (1992). Hypoglycemic activity of olive leaf. . Journal of Medicinal Plant and Natural Product Research. 58, 513-515. Gordon M.H, Paiva-Martins F, Almeida M (2001). Antioxidant activity of hydroxytyrosol acetate compared with that of other olive oil polyphenols. Journal of Agricultural and Food Chemistry. 49, 2480– 2485. Gorinstein S, Leontowicz H, Lojek A, Leontowicz M, Ciz M, Krzeminski R, Gralak M, Czerwinski J, Jastrzebski Z, Trakhtenberg S, Grigelmo-Miguel N, Soliva-Fortuny R (2002). Olive oils improve lipid metabolism and increase antioxidant potential in rats fed diets containing cholesterol, Journal of Agricultural and Food Chemistry. 50 6102–6108. Inouye M, Mio T, Sumino K (1999). Link between glycation and lipooxidation in red blood cells in diabetes. Clinica Chimica Acta. 285, 35– 44. Jemai H, Bouaziz M, Fki I, El Feki A, Sayadi S (2008). Hypolipidimic and antioxidant activities of oleuropein and its hydrolysis derivative-rich extracts from Chemlali olive leaves. Chemico-Biological Interactions. 176:88–98. Jennings P.E, McLaren M, Scot N.A, Saniabadi A.R, Belch J.J.F (1991). The relationship of oxidative stress to thrombotic tendency in type I diabetic patients with retinopathy. Diabetic Medicine. 8, 860– 865. Khayyal MT, el-Ghazaly MA, Abdallah DM, Nassar NN, Okpanyi SN, Kreuter MH (2002). Blood pressure lowering effect of an olive leaf extract (Olea europaea) in L-NAME induced hypertension in rats. Arzneimittelforschung. 52:797–802. Komaki E, Yamaguchi S, Maru I, et al (2003). Identification 27. of anti-alpha-amylase components from olive leaf extracts. Food Science and Technology Research. 9:35-39. Krzeminski R, Gorinstein S, Leontowicz H, Leontowicz M, Gralak M, Czerwinski J, Lojek A, Ciz M, Martin-Belloso O, Gligelmo-Miguel N, Trakhtenberg S (2003). Effect of different olive oils on bile excretion in rats fed cholesterol-containing and cholesterol-free diets, J. Agric. Food Chemistry. 51 5774–5779. Kubo A, Lunde C.S, Kubo I, (1995). Antimicrobial activity of the olive oil flavor compounds. Journal of Agriculture and Food Chemistry. 43, 1629–1633. Lasserre B, Kaiser R, Huu Chanh P, Ifansyah N, Gleye J, Moulis C (1983). Effects on rats of aqueous extracts of plants used in folk medicine as antihypertensive agents. Naturwissenschaften. 70:95–6. Lee-Huang S, Zhang L, Huang PL, et al (2003). Anti-HIV 16 activity of olive leaf extract (OLE) and modulation of host cell gene expression by HIV-1 infection and OLE treatment. Biochem Biophys Reserch Commun. 307:1029-1037. Madar Z, Maayan N, Sarit O, Eliraz A (2004). Antioxidants modulate thenitric oxide system and SOD activity and expression in rat epithelial lungcells. Asia Pacific Journal of Clinical Nutrition. 13, S101. Manna C, Migliardi V, Golino P, Scognamiglio A, Galletti P, Chiariello M, Zappia V (2004). Oleuropein prevents oxidative myocardial injury induced by ischemia and reperfusion. J Nutrition Biochemistry. 15:461–6. Markin D, Duek L, Berdicevsky I (2003). 19. In vitro antimicrobial activity of olive leaves. Mycoses. 46:132-136. Martinez-Gonzalez MA, Bes-Rastrollo M, Serra-Majem L, Lairon D, Estruch R (2009). Trichopoulou A. Mediterranean food pattern and the primary prevention of chronic disease: recent developments. Nutrition Review. 67 Suppl 1:S1116. Masella R, Vari R, D’Archivio M, Di Benedetto R, Matarrese P, Malorni W, Scazzocchio B, Giovannini C (2004). Extra virgin olive oil biophenols inhibit cell-mediated oxidation of LDL by increasing the mRNA transcription of glutathione-related enzymes. Journal of Nutrition. 134, 785– 791. Micol V, Caturla N, Pérez-Fons L, et al (2005). The olive 17. leaf extract exhibits antiviral activity against viral haemorrhagic septicaemia rhabdovirus (VHSV). Antiviral Reserch. 66:129-136. Pereira A.P, Ferreira I.C.F.R, Marcelino F, Valentao P, Andrade P.B, Seabra R, Estevinho L, Bento A, Pereira J.A (2007). Phenolic Compound and Antimicrobial Activity of Olive (Olea europaea L.Cv.Cobrancosa) leaves. Journal of Molecules. 12, 1153-1162. Petkov V, Manolov P (1978). Pharmacological studies on substances of plant origin with coronary dilatating and antiarrhythmatic action. Comparative Medicine East and West. 6, 123– 130. Pieroni A, Heimler D, Pieters L, et al (1996). 24. In vitro anti-complementary activity of flavonoids from olive (Olea europaea L.) leaves. Pharmazie. 51:765-768. Prasad K, Kalra J (1993). Oxygen free radicals and hypercholesterolemic atherosclerosis, American Heart Journal. 125 958–971. Pyo Y.H, Lee T.C, Logendra L, Rosen R.T (2004). Antioxidant activity and phenolic compounds of Swiss chard extracts. Food chemistry 85: 19-26. Renis HE (1969). 15. In vitro antiviral activity of calcium elenolate. Antimicrob Agents Chemother (Bethesda). 9;167-172. Ryan D, Antolovich M, Prenzler P, Robards K, Lavee S (2002). Biotransformations of phenolic compounds in Olea europea L. Scientia Horticulturae. 92, 147–176. Shams-Ghafarokhi M, Razafsha M, Allumeh A, Razzaghi Abyaneh M (2003). Inhibitory Effect of Aqueous Onion and Garlic Extracts on Growth and Keratinase Activity in Trichophyon Mentagro Phytes. J of Iran Biomed. 7: 113-118. Soler-Rivas C, Espin JC, Wichers HJ (2000). Oleuropein and related compounds. Journal of Science Food Agricultur. 80:1013–23. Somova L.I, Shode F.O, Ramnanan P, Nadar A (2003). Antihypertensive ,antiatherosclerotic and antioxidant activity of triterpenoids isolated from olea europaea, subspecies Africana leaves. Journal of Ethnopharmacology, 84:299-305. Srinivasan P, Sabitha K.E, Shyamaladevi C.S (2007). Attenuation of 4-nitroquinoline 1-oxide induced in vitro lipid peroxidation by green tea polyphenols. Life Science, 80:1080–1086. Sung JH, Choi SJ, Lee SW, Park KH, Moon TW (2004). Isoflavones found in Korean soybean paste as 3-hydroxy-3-methylglutaryl coenzyme A reductase inhibitors. Biosci Biotechnol Biochem, 68:1051-1058. Tiot R, Volsteedt Y, Apostolides Z (2001). Comparison of the antioxidant content of fruits, vegetables and teas measured as vitamin C equivalent. Toxicology, 166: 63-69. Visioli F, Bellomo G, Montedoro G.F, Galli C (1995). Low-density lipoprotein oxidation is inhibited in vitro by olive oil constituents. Atherosclerosis, 117, 25– 32. Visioli F, Galli C (2001). Antiatherogenic components of olive oil. Current Atherosclerosis Reports 3, 64– 67. Visioli F, Poli A, Galli C (2002). Antioxidant and other biological activities of phenols from olives and olive oil. Medicinal Research Reviews, 22, 65– 75. Walker C, Reamy BV (2009). Diets for cardiovascular disease prevention: what is the evidence?. American Family Physician, 79:571–8. Wang L, Geng C, Jiang L, et al (2008). The anti-31. atherosclerotic effect of olive leaf extract is related to suppressed inflammatory response in rabbits with experimental atherosclerosis. European Journal of Nutrition, 47:235-243. Wolffe S.P, Jiang Z.Y, Hunt J.V (1991). Protein glycation and oxidativestress in diabetes mellitus and ageing. Free Radical Biology & Medicine, 10, 339– 352. Young C.E, Karas R.H, Kuvin J.T (2004). High-density lipoprotein cholesterol and coronary heart disease. Cardiology Reviews, 12 (2) 107–119. Zarzuelo A, Duarte J, Jimenez J, Gonzales M (1991). Utrilla Vasodilator effect of olive leaf. Planta Medica, 57, 417-424.